Bajka and Max Weissenfeldt first met each other when they both attended the same school in Munich, Germany. Their first recordings - under the name Goldenes Zeitalter - took place in 1998 and have proven to be a homage to the nowadays beloved spiritual-jazz-vibe in the manner of Alice Coltrane and co. and were released in 2005 by Jazzman Records. 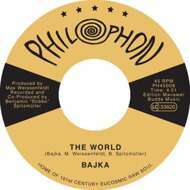 Now, Bajka has found her way back to her musical family and joined Philophon - the right environment for such a unique voice, joining a growing roster of talented artists including: The Polyversal Souls, Roy X, Guy One, Alogte Oho Jonas, Hailu Mergia, Idris Ackamoor and The Pyramids, Jimi Tenor and Y-Bayani. "The World" is driven by the heavyweight drumming of Max, counterpointed by the iridescent voice of Bajka. She reflects the glory of our world by showing the listener through her talent that she in person is for sure part of that glory. On the flip side, "Invisible Joy", Bajka gives her own interpretation of Philophon's own label anthem, which was already the title track of The Polyversal Souls' celebrated debut album.